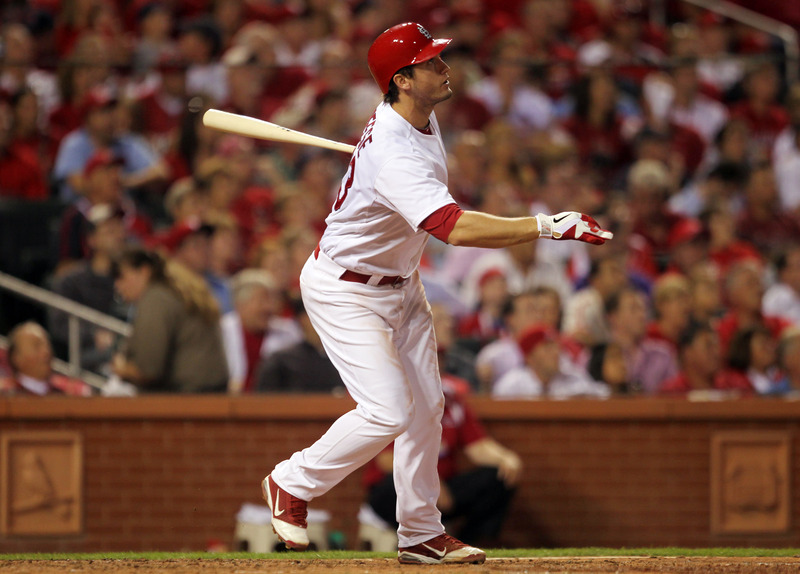 Third basemen David Freese drove in four runs to the Cardinals to a 5-3 win over the Phillies and force a game five Friday night in Philadelphia in their NL Division Series. Freese hit a two run double off a hanging off speed pitch from Phillies starter Roy Oswalt to put the Cardinals on top 3-2. Later in the sixth inning, Oswalt tried to adjust by attacking Freese with an inside fastball, but he lofted one deep into the grass background past the center field wall to put the Cardinals up 5-2. The Phillies scored a run in the eighth on a wild pitch, but Jason Motte retired the Phillies in order in the ninth for the save as Edwin Jackson picked up the win after getting past a shaky first inning. Jimmy Rollins led off the game with a ground rule double and Chase Utley tripled him home and scored on Hunter Pence’s single. Jackson got out of the jam on a strike ’em out, throw ’em out as Ryan Howard struck out looking and Pence was gunned down at third. From that point on, Jackson allowed just two hits while going six innings. Former Missouri State Bear, Howard, went 0 for 4 with three strikeouts. The St. Louis native is hitting just .176. Game five will feature Roy Halladay and Chris Carpenter, former teammates in Toronto.